OP-TANKS is a design, fabrication, manufacturing, welding and machine shop in Pleasant View, Utah specializing in water and oilfield tanks. OP Tanks' personnel are highly trained and experienced designers, fabricators, and manufacturers of custom water and oilfield tanks, frac tanks, frac masters, and other metal products built on a foundation of inherent value. We at OP Tanks measure our success only through your success. We consider ourselves a part of a much larger community in which we feel compelled to act honestly and responsibly. We do this only when we help protect our environment, provide economic opportunity fairly, work safely, and consider the individual in all of our business affairs. We are committed to provide the highest quality of products and services to our customers by being 100% dedicated to continuously improving what we do every step of the way. Our customers' needs and safety are our top priority. employees continue to be successful. OP TANKS, LLC is committed to manufacture products that meet requirements. This is accomplished through a total quality commitment of our people, involvement of our suppliers, customers, and by adherence to plant policies and procedures with an emphasis on safety at all times. OP Tanks, LLC audits our products and processes to ensure compliance to our specifications and continuously improve our QMS. OP Tanks has earned API Spec Q1/ISO 9001:2015 Quality Management System certifications. These certifications ensure processes and procedures are followed, so our customers receive defect-free products that meet their expectations. As an API member, we are up-to-date on the latest standards, policies, and design requirements. Each of our customers are important to us, that's why our tanks meet API standards and customer specific requirements. 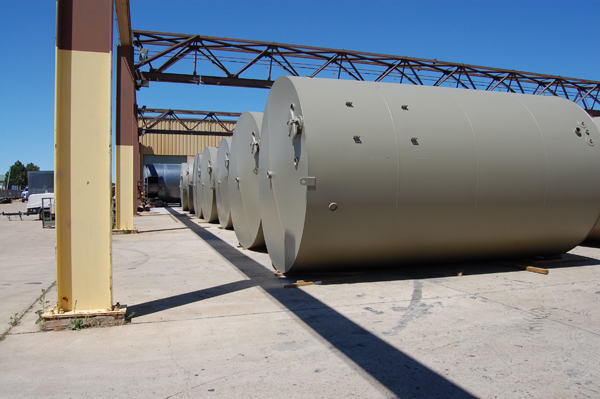 OP Tanks has earned the API Spec 12F certification for shop welded tanks for storage of production liquids. This certification ensures our licensed tanks are designed to safely store crude petroleum and other liquids. We manufacture both API 12F monogrammed and non-monogrammed tanks for the oil and gas industry.